Willow Springs Senior Living in Redding, CA, provides both Alzheimer's care and respite services to residents in our 56 bed community. Our on-site health services manager makes it a priority to keep family members and physicians a part of our circle of care for each resident. 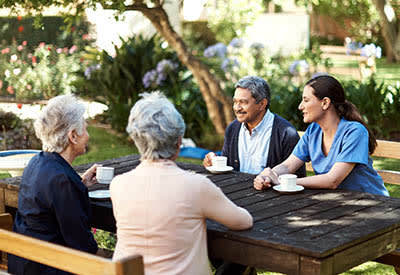 Memory Care: Residents of Willow Springs Alzheimer's Special Care Center receive the care of specially trained staff and nursing members in our Meaningful Moments® program. We learn the individual life stories of our Alzheimer's residents and use them to bring deeper meaning to their days. Respite Care: Whether you are a senior recovering after a hospital stay or injury or a loved one looking for short term assisted living care for your family members with dementia, we'd like to be your go-to resource for respite care. Dressing, bathing and pain and medication management are all provided, along with other assistance to make daily life easier while healing. Both our dementia and respite care residents have a choice of floor plans for an affordable and social experience.